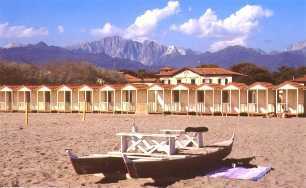 Seaside resort at mid distance between Marina di Massa and Viareggio, Forte dei Marmi is loved by Italians and Foreigners for its beaches, numerous restaurants and the nightlife. The Fort, built in 1788, is located in the main square and as the town is named after it, it has become its symbol. Forte dei Marmi is crowded with people at any time, night and day. Shops and art galleries are open till late at night. The Wednesday morning market is popular with tourists and visitors all year round. And it's not far from the Versiliana park, where cultural, artistic and musical events take place throughout summer.